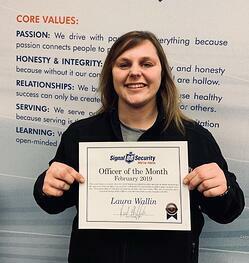 Signal 88 Security is pleased to honor Officer Laura Wallin of Signal 88 Security of Wichita, KS, as February 2019’s Officer of the Month. "Throughout her time here at Signal 88, Officer Wallin has proven herself to be driven towards self-improvement in order to provide the best possible service that she can. She is consistently one of our top performing officers and truly shows that she puts passion into everything she does. Having never worked in the security industry before, she is a shining example of someone that takes on every challenge with her best foot forward in order to accomplish her goals." Laura is described as putting passion into everything she does. Passion is one of Signal 88’s Core Values because it connects people to purpose. We view our purpose as providing peace of mind, and people like Laura are the ones who make it happen every day. Laura, we are proud of you and grateful for your contributions to the Wichita franchise and the Signal 88 brand!